This dress has been sitting in the back of my wardrobe semi-forgotten for two years – without buttonholes and hem! Long time readers might even recognise these cuffs from my tutorial on attaching a shirt cuff and the associated one on continuous bound sleeve plackets – both written about two years ago. Well I’ve finally finished the actual garment! Mmm.. they look less red in real life. It looks like I sewed them on a bit tight though…shall I do them (all 12…) again? Thanks Sunni, I always wondered how they worked! 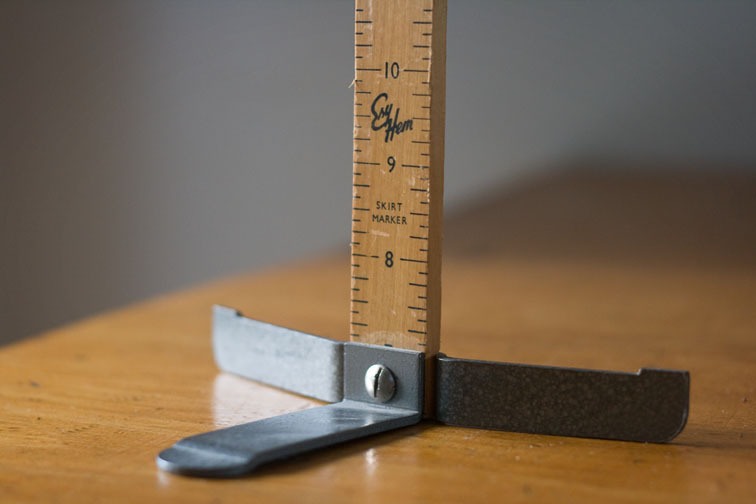 I think the ruler might have been broken at one stage though, as it starts at 8″ and is a bit short. (But both are like that – is that normal?? And why??) Anyway, if I lower my mannequin down to it’s shortest height it is tall enough to be of use. And work it did – after cutting along the line of pins, my hem was perfectly level! Yay – a new dress to wear! I can’t believe I go to the effort of making things and drift focus, stopping when they are 95% finished. Am I the only one with this problem? Perhap my resolution for Matariki should be to finish things, rather than just start them! This does look gorgeous and I can just imagine how swishy it is to wear. I'm sure you'll get so many compliments that you will wonder why you didn't finish it sooner. I could have done with one of those hem markers this week. I was hemming a dancing circle skirt for my daughter and I'm not sure that it ended up very even at all. Lovely. The whole outfit looks very fun. Sherry – your dress looks absolutely beautiful. Wow so much work and all so beautifully done. As to starting things and not finishing even though you are so close – I know all about it. Do it often. The latest is a knitted jacket/cardigan. I started in 2005 and knitted until there was only four rows of the band remaining. I stopped as I thought it looked too short and I suddenly didn't like it anymore. The other day I found it in a box, pulled it out, decided to finish it and wouldn't you know it – it fits just fine – and I love it. I will blog about it shortly. The ruler on my skirt marker starts at about 8 inches too. 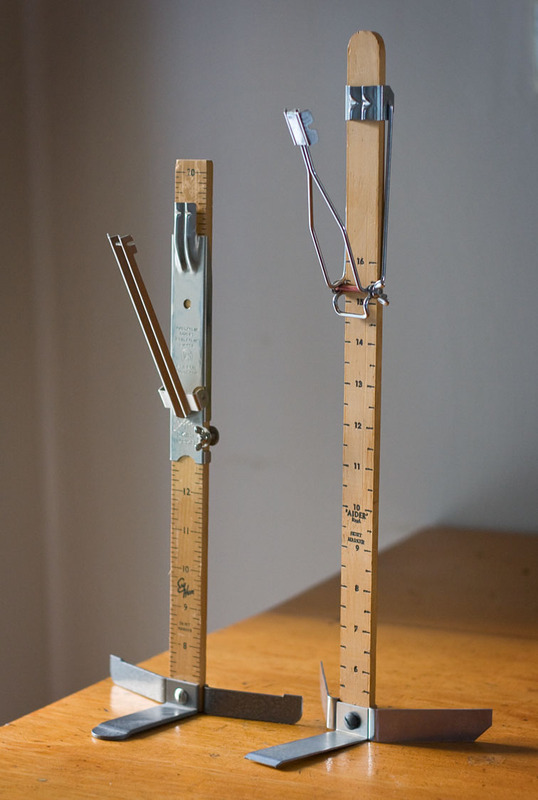 My best guess is that it's because when the mechanism is at its lowest position, the pins will sit about 8 inches above the ground. So it's basically giving you the height from ground level of your hem (taking the reading from the bottom of the mechanism rather than the top). I could be wrong though. One of my plans/resolutions/initiatives for 2012 has been to get less flaky and finish projects that I start consistently–it's one of those things that's always a challenge, I think. Nope, you are not the only one with the “almost finished” and lose interest problem. Unfortunately, I'm afflicted with it too. Beautiful dress; pintucks are perfect! Worth the wait! This is so chic and classic! It reminds me of low-key, glamorous 1970s style. The colour suits you perfectly. Oh, I love this! Especially the pintucks and the swish factor! 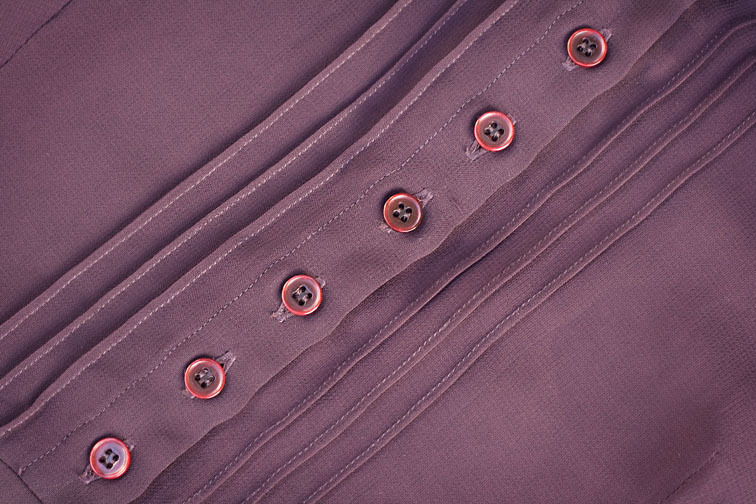 You are not alone — I took time yesterday to make and finish 19 buttonholes, on two languishing garments. Sewed the buttons into place in the car on the way to deliver them to the intended recipient (who has been expecting them for two weeks now). Luckily she is family and knows how I am about these things … nice for you to have a brand-new dress, and unexpectedly! Yes. You measure from the floor up with these markers. Modern ones are made of plastic, and are not nearly so indestructible as the wood-and-metal ones. 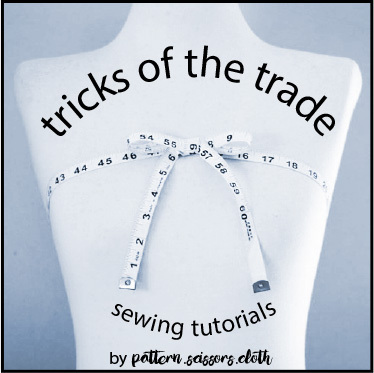 Mine has a bulb marker — intended to be filled with chalk powder, but I put in talcum powder, or baking soda, or flour … whatever will show up on the fabric, and cling long enough for me to mark with a soap sliver or pins for cutting the hem. Oh! I have this dress on my must sew list! Thank you for making it up. You are right about the fun 70s vibe. It looks lovely. There is no point in rushing into these things after all. The dress aged nicely for the years it was in the closet, didn't it? Seriously tho, they say procrastination is linked to perfectionism. I know for me that is true. When I am making something, a flaw or error, real or perceived, can make me lose interest in that project. If I give myself sufficient time to forget the “flaw”, I will happily finish it and wear it. Could that be what happened to your dress? I do that so frequently – too frequently. I have more projects (mostly knitting) stalled at 95% – & often because of having run into a glitch of some kind. My mother used to say “incorporate your mistakes”, but I just have to fix.them.right. Must get into fixing some of them right & actually use! Sherry – that dress weight & swish-factor is great! Well, I can certainly identify with the “losing focus” issue. Whenever I get to almost done, I leave it and move on to something else. I think it has to do with getting to a part that requires more “work” that I am not in the mood to do, so I invent something else to do to take my mind away from the project. I think it is also a bit of ADHD, which I am sure I have, as I usually have at least 3 different projects that I am working on at once. So, no,you are not alone in this, I think it is a commonality among creatives, always thinking of the next thing to do. I love the color. And I can only imagine how fun that is to wear with all that swishy georgette. Very pretty! Lovely. The swishiness & the color are so RICH. 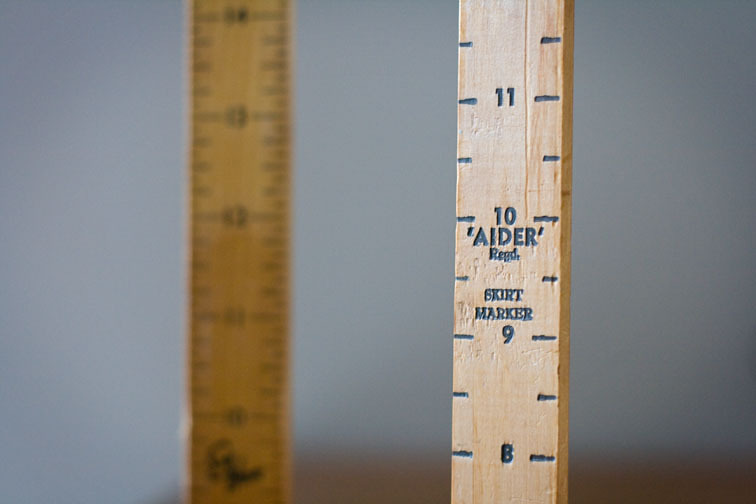 I'm also a bit envious of your lovely wooden hem-marking rulers. I've been meaning to get one (after seeing how it worked in a sewing class), but am trying to pay for a trip to Spain & a new kitchen now. Fantastic dress, great color on you. Fun to see you in your long sleeve dress and tights, as we are in the heat of summer here 🙂 I particularly like the skirt on this dress, the pleats are interesting, they look different front and back. I bet this dress would also be great in a wool challis. Oh, this is beautiful! Now aren't you glad that you finished it? While I do tend to work on several projects simultaneously (the mind always jumps to the next project before I've even finished cutting something) I do try to get to the end of a project in reasonable time. Right! Then why do I have UFOs hiding in the sewing room? Gorgeous- that bodice is enviable work. Beautiful dress and impeccable work! Looks fantastic on you, and I can just imagine the “swish” with movement. Wow, scratch one off the UFO list! Great dress! The colour is beautiful, and what a great idea to winterize a light fabric with multi-layers, boots and tights.It looks gorgeous on you. I have a 3, no 4 month old dress of doom I can't seem to finish. I am not really sure why I am finding it so uninspiring. I had noticed that dress in the magazine but couldn't see past the white – seeing your gorgeous version has put it on my “will get to one day” list. Your dress looks terrific. Unfinished sewing projects are a problem for me too. I try to finish off one garment before starting another. This of course only works if I like what I've made!! OMG – this dress has been on my sewing list ever since the issue came out, and I loooove it. but I have yet to find the righ fabric for it. I'm not a fan of viscose so I would probably go for cotton. Do you have any recommendations, for fabric or for making this? It looks great by the way!! It would have been ideal for a circle skirt! I think they are worth having, I might have to go through my wardrobe and check everything now! I think I am even worse with knitting! Ooh thanks for that, it makes total sense now! ElleC – Yes, yes, yes – I hemmed it then realised it was unlevel! I couldn't face unpicking and resewing the double layers, but the hem marker helped ease the pain! Yes I am glad I finished it because I imagine I will wear it a lot – unlike some things I've made! A cotton or cotton/silk voile would be nice! Congratulations on finishing this wonderful dress. It's definitely a classic style. Great dress. It looks fabulous on you! And you're not the only one to almost complete a garment and then forget about it. 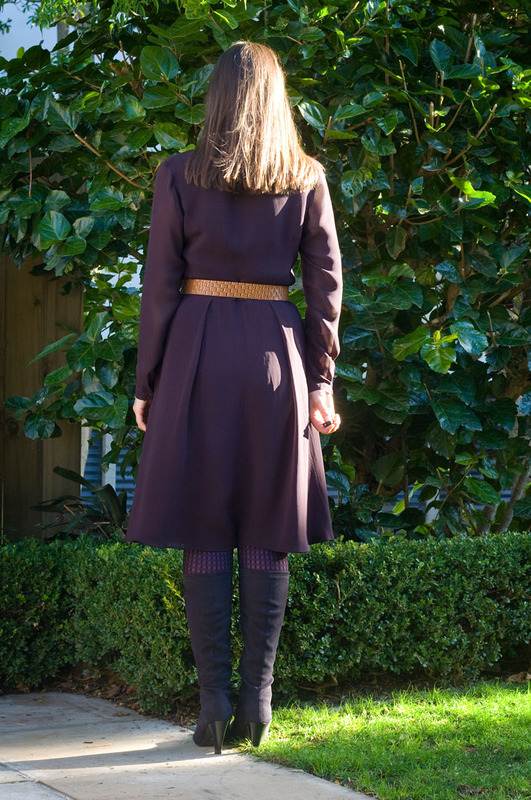 I have a skirt waiting for a hem – but since it is a fall skirt, it's on the back burner for now. And I have a pair of pants that need a button! Wow – it really shows off your gorgeous figure. Has it really been sitting that long? So good it's into your wardrobe and can get out and about into the real world. Yesterday I was looking for a piece of fabric in stash and I found 2 pieces of Global merino that I paid FULL PRICE for thinking I would make them up straight away thus negating the need to wait for sale time. They are still there, neglected 2 years later. The lesson in that must surely be that is worth buying lots of fabric at sale time since either way it won't get used for ages but at least this lot will be cheaper. Beautiful dress. Love the colour and the drape. hello I love those pintucks . Did they go through both layers and how do you get them looking so perfect . Is there an industry trick to this ?. I have one of those hem markers too and am about to use it tonight to shorten a sunray pleated skirt .Wish me luck! Gorgeous, what a great addition to your wardrobe. Definitely worth finishing! Good luck! Re the pintucks, they are just sewn on the outer layer, thank goodness! My tips are to notch either end when cutting, fold (it should be on grain) and edgestitch with a standard foot. If you sew the subsequent ones with the previous one uppermost you can make sure your stitching is parallel, and press last not first! The skirt went well and thanks for your reply That makes alot of sense. Great dress and how I want one of those rulers!! What a pretty dress I love everything about it. What a great dress. I made a mental note to remember the pattern when I saw this old Burda style in the library not long ago. Now I just want one! Those hemming tools are nifty – I've been known to use a tissue box with a ruler sticky-taped to it 🙂 Yours look a million times nicer though! This dress is just wondefull and God, I like Biba and the seventies!!! I love this dress! It's nothing but gorgeous and while it has sat in your wardrobe for years, it has stood the test of time beautifully. It's as lovely today as it would have been way back in the Biba time. I'd love to put this one together myself, but sadly, I've scanned through the archives using the info you provided to no avail!